A year ago (December 14, 2009), The Cruise Examiner wrote about cruising in the Dominions (Canada, Australia and New Zealand, and at one time South Africa) and followed up with an article on the "Boom Down Under" (February 22, 2010). Since then, with the overall Australasian market accounting for almost 450,000 cruisers, there has been further development, with the market now supporting half a dozen indigenous cruise ships, including one now based at Auckland, plus a number of seasonal visitors. As Sydney, now in the heat of summer, prepares for its traditional New Years Eve harbour fireworks, we take a further look at trends down under. Meanwhile, still south of the equator in the Austral summer, the seasonal South African market now supports two cruise ships. Earlier this year, David Dingle, ceo of Carnival UK and also responsible for Australia, noted that twelve ships from Carnival brands - P&O Australia, P&O Cruises, Princess, Cunard and Seabourn would be cruising from Australia this season, of which half would be local ships actually based there. He went on to predict that Carnival Australia would book 190,000 passengers this year and this would rise to 300,000 in 2010-11 and 350,000 in 2011-12, a two-year increase of almost 85%. Part of this growth is of course coming from P&O Australia, which has now taken over the two ships that operated for the defunct Ocean Village brand, thus increasing its own fleet to four ships. The Ocean Village 2 became the Pacific Jewel, based in Sydney, last year, while just last week the original Ocean Village started cruising from Auckland as the Pacific Pearl. The Pacific Jewel's sister ship Pacific Dawn, came to P&O Australia directly from Princess Cruises in 2007, and is now based in Brisbane. Capt Chris Wells, now in command of the new Queen Elizabeth, was in fact master of the Pacific Dawn when she first moved to Brisbane in December 2009. The Pacific Sun, meanwhile, an ex-Carnival ship, now cruises from Fremantle, Newcastle, Sydney and Brisbane. While P&O Cruises remains a little more true to the traditional cruise line - after all, it can trace its roots through its parent company back to 1837. Princess Cruises' two Australian-based ships meanwhile offer a more North American-style product that is quite popular in Australia. 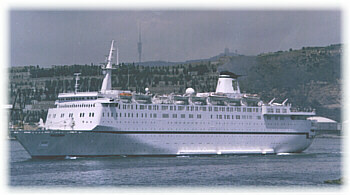 Being of more recent build, they also offer many more balcony cabins than the P&O ships. The Dawn Princess this year offered the first world cruise from Australia, when it sailed from Sydney in late May on a three-month circumnavigation that ended in early September. This was successful enough that it will be followed by a second, 104-day, world cruise on May 25, 2011. This has effectively added Australia to the countries that offer world cruise departures, which include the US, the UK, Germany and Italy. Dingle's visit was followed by one from Cunard president Peter Shanks, who revealed that Cunard will attract 10,000 cruisers from Australia this year, up 25% on last year. Not bad for a line whose ships have usually only called on Australia once a year on their world cruises. Indeed, next year, the Queen Mary 2 will circumnavigate Australia, on the first such cruise to be offered by a Queen, leaving Sydney on February 14, 2012, for a 22-day circumnavigation as part of her usual world cruise. All of this has lead to a pronouncement by Ann Sherry, ceo of Carnival Australia, that by 2020 Australia will be generating a million cruise passengers annually. And with the Australian economy and the Australian currency both showing great strength despite the world recession of the past couple of years, most cruise lines, including the upmarket ones, report a lot of support coming from Australia. Indeed, Crystal even reported that it had recently received more bookings from Australia than from the UK. Meanwhile, this October Royal Caribbean International's 2,112-berth Radiance of the Seas will join the 2,000-berth Rhapsody of the Seas in the Australian market, the first time that Royal Caribbean has had two ships based there. There is talk now that Royal Caribbean might even base a ship year-round in Australia starting in 2012. Sister company Celebrity Cruises will also start an Australasian program, with the arrival in November of its Celebrity Century to cruise from Australia and New Zealand. 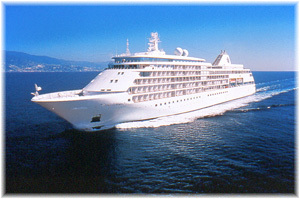 Silversea's Silver Shadow will meanwhile perform a 30-day Australian circumnavigation, which leaves Sydney on January 19, 2011, and calls at Brisbane, Whitsunday Islands, the Great Barrier Reef, Port Douglas, Cooktown, Darwin, Broome, Exmouth, Perth, Albany, Port Lincoln, Adelaide, Geelong, Melbourne and Hobart, Tasmania, before returning to Sydney on February 18. Finally, in a public relations exercise, P&O Cruises Australia published its first sustainability report this month, disclosing that in 2009 it had reduced the amount of fuel used per passenger by 18% and the amount of freshwater used by 24%. It also declared that it would reduce air emissions through fuel efficiency and sign a $1.6 million partnership with the Australian Government to develop to integrated destination management systems in their main destination, the Pacific Islands. As ever, the environment remains key to the future success of cruising. While New Zealand looks strong, its cruise market is made up mostly of foreigners. But it is clear that the Australian market is very underdeveloped and the forecasts now being made will not be far off the mark, especially if we look at how the number of cruisers has increased in countries such as Germany, Italy and Spain in recent years. 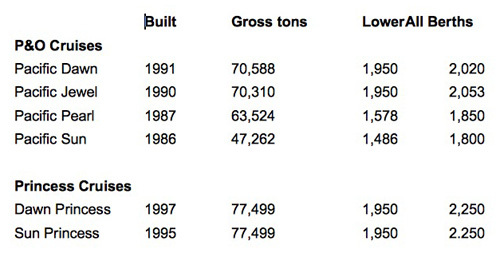 Indeed, at the same penetration level as the UK, the Australian market should produce in excess of 500,000 cruisers. Although it has a much smaller population, this will also apply to New Zealand. Meanwhile, in Perth, Classic International Cruises brought the Athena back to the Western Australian market last week and the Princess Danae is now also offering fly/cruises for Australians in Southeast Asia. The only bad news on the Australian cruise scene is a suggestion earlier this month that all cruise ships leaving Australian ports should carry Australian federal police. This recommendation comes from the coroner in the case of Dianne Brimble, who died on board the Pacific Sky in September 2002 after taking an overdose of alcohol and the drug fantasy, which she was given by a crew member. The coroner's report appeared on December 3, eight years after the event and four years after the inquest opened. The Pacific Sky left the P&O Australia fleet in May 2006 but some interested parties in Australia are calling for similar security regulations to those that have recently been introduced in the United States. In 2008-09, of the 119,000 cruisers said to have left New Zealand ports, 90% were reported to have been visitors, mainly from America, Canada and Australia, while about 12,000 were New Zealanders. Overall, however, that number has almost tripled in four years, having numbered only 40,000 in total in 2004-05. Meanwhile, a report earlier this year by the New Zealand Government and Cruise New Zealand predicted that the New Zealand market would grow to 138,200 in 2010-11 and close to 200,000 in 2011-12. Indeed, the New Zealand market was strong enough for P&O Cruises to lengthen its 2009-10 Auckland season for the Pacific Sun, after her 2008-09 season sold out, with 12,000 Kiwis cruising in her over just two months. P&O Cruises' latest move, therefore, is to base a larger ship in Auckland. Thus the Pacific Pearl departed on her maiden New Zealand cruise last week after her christening on Tuesday by New Zealand Olympic gold medalist Barbara Kendall MBE. With the Pacific Pearl provisioning, refueling and embarking passengers in the port of Auckland she is expected to contribute about $18 million to the local economy in 2011. It appears that some progress has finally been made in growing the New Zealand market as well, with 80% of the Pacific Pearl's bookings reported to have been made by New Zealanders. We all know about Seatrade Cruise Review, Cruise Business News, Cruise Industry News, Cruise International and the World of Cruising, not to mention Cruise Travel, Ocean & Cruise News and Porthole in the US. But one publication usually escapes the limelight except in its own market. Those who want to keep track of what is happening "down under" could do no better than subscribe to "World Wide Cruising News & Pictorial," founded in 1998 by the Traecy family, and now entering its thirteenth year of publication. With two ships now in the market, South Africa now also has its largest cruise ship yet with the 2,100-passenger MSC Sinfonia, based on Durban for the 2010-11 South African summer season. The MSC Sinfonia is expected to carry some 70,000 cruisers this season, mainly to the Indian Ocean islands. Meanwhile, the smaller MSC Melody, which has been serving South Africa for the past few winters, having replaced the smaller MSC Rhapsody, will be developing new itineraries out of Cape Town. With two ships operating out of South Africa, MSC will be this year be providing an overall capacity of 100,000 cruise passengers. MSC cruises are marketed in South Africa by the long-standing Starlight Cruises operation. Many cruises this year will be shorter 2-night cruises to nowhere from Cape Town or Durban, 3-night cruises between Cape Town and Durban and 4-night cruises from Durban to Maputo and Portuguese Island or Maputo and Barra Lodge or 5-night cruises to all three, but 9-night and 11-night cruises to Mauritius are also included in this year's program. The season will also feature two 18-night positioning voyages back to Italy via the west coast of Africa, thus avoiding potential meetings with pirates on the way north. The MSC Melody leaves Cape Town for Genoa on March 7 and MSC Sinfonia will follow from Cape Town on May 3, bound also for Genoa, with calls en route at Walvis Bay and Dakar on the African coast..
Durban has long been an important base for MSC's container operations and in the days when their container ships carried passengers, before they entered the cruise business, their container ships offered weekly passenger service between Durban and Australian ports. Although this is now long gone, MSC has put its effort into developing the local South African cruise market instead in that time.